Autograph Letter Signed, Georgia O’Keeffe, one page, quarto, Abiquiu, July 25, 1969. To Elizabeth Monroe. With the original envelope. “Dear Elizabeth Monroe / When you are in Santa Fe drop me a note and plan to come up some morning. The envelope is addressed by O’Keeffe with her name and address (Abiquiu, New Mexico 87510) imprinted on the back flap. In the summer of 1934, while recuperating from a nervous breakdown, she visited Ghost Ranch, north of Abiquiu, for the first time and decided immediately to live there. She purchased a house on the ranch property. A decade later, on the last day of December 1945, Georgia O’Keeffe bought a second house, in Abiquiu, south of Ghost Ranch. It was an abandoned hacienda which was practically in ruins. The buildings were falling down, the roofs had caved in, and the old adobe was sliding into flattening heaps of mud. It did have much-coveted water rights, a beautiful and enigmatic door in the long wall of its patio, and three acres of land. A complete renovation was necessary. Georgia O’Keeffe entrusted the task to Maria Chabot, a young friend who about the same time inherited a nearby ranch. The project took nearly four years to complete. In 1949, after wrapping up the estate of Alfred Stieglitz in New York, she moved to her newly renovated, now finally habitable, hacienda forever. 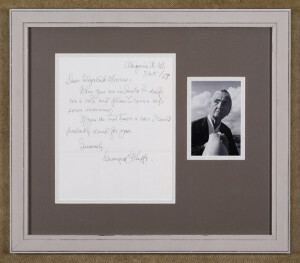 Framed (with a cream inner mat and a taupe outer mat, with a photograph, in a beige wood frame) dimensions: 20 3/4 inches wide by 18 1/8 inches high.